BB MD of BOD comes to OKC to visit TAB! Enough acronyms for you? BB = blogger bestie. I wouldn’t say we still use this term because we are real life besties instead of just blogger besties, but back in 2014 when Molly and I first virtually met, we were BBs through and through. BOD = Bridget’s Own Diary aka Molly’s corner of the internet. OKC = only the greatest big league city you’ll ever meet! If you’ve read Take A Bite for a while, you know Molly! We initially met through blogging (yes, it’s true), but have since met up at ACL weekend, OU/Texas games, Houston, Dallas, her wedding, and talk multiple times a week. We had talked about it multiple times, but I was so excited when Molly texted me letting me know the plane ticket had been booked and she was heading to OKC end of January! I pulled out my OKC City Guide (yes I use my own city guide) and started crafting out our weekend. 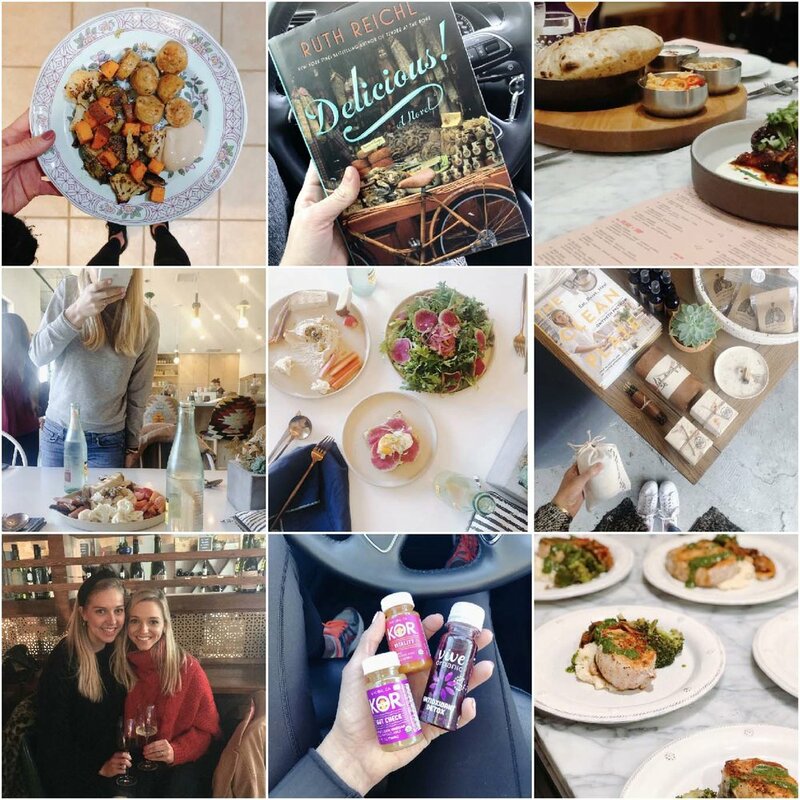 Barre3, lunch at Kitchen at Commonplace, midtown shopping at Commonplace, Shop Mode, Salt + Water, Chirps and Cheers and Sara Kate Studios. A hot tea pick me up at Coffee Slingers then natural manicure at Well Beauty. Wine flight at Anatomy Wine Bar and then dinner at Goro Ramen. I loved showing off my city, but even more, enjoyed getting to make stops I don’t get to make everyday. They say to play tourist in your city. But really, you should do it. I was a host, but felt like a tourist. I felt like I was looking at Oklahoma City in a new way. I’ve always loved where I’m from, but I was so excited/proud getting to show off my friends, fam and favorite spots in little ole Oklahoma. Last week deserves more of a spotlight on the weekend! I don’t want to give away full details as I am working on a separate post to fully document the weekend, but Molly came to visit me in OKC! I had a blast crafting our weekend plans, and couldn’t wait to share my city with her! If you know me and Take A Bite, you know Molly and Bridget’s Own Diary. Catch a glimpse in this bites post and a full recap coming soon. -Easiest way to come off vacation and ease into the week is to keep your food healthy and simple. I always overindulge in my diet and my wallet while on trips. So I kept my post-California dinners simple, cheap and healthy with roasted veggies and chicken sausages (with lots of dijon for dipping). How do you transition after vacations? -If you love food and romance, I recommend Delicious, but esteemed chef and food writer Ruth Reichl. I was gifted this book by my sister’s mother-in-law, who clearly knows me well! Next up on my 2019 reading list is this one. Shop my reads on amazon. -MB(now D) made her way to OKC this past weekend and our first stop was rightfully so at The Jones. Dips + Spreads extra dough was the highlight of our girls night dinner! -A trip to Kitchen at Commonplace for the food and the perfectly styled photos. -I geek out over a place where the space and food are equally photographable. 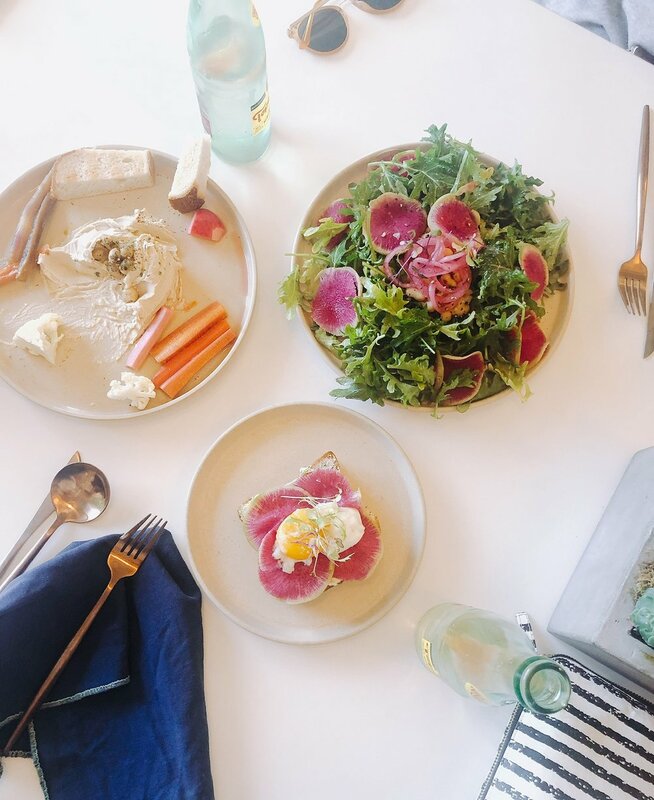 -OKC people, have you been to Salt + Water? We popped in on their last day in their temp space, but they are taking residence off Lee Ave downtown and they are your top shop for all things natural beauty. -I love these wellness shots from KOR. I love to pick one or two up from Whole Foods when I’m feeling sluggish, on the edge of a cold or after eating all the things. -You may remember this meal when I posted it after the first Sur La Table class I took with my mom and sister. Well, we recreated our ‘Tuscan Kitchen’ meal for family Sunday dinner and it was just as good as when we made it in class. Super bite: With the Super Bowl this Sunday, I have agreed to bring Perfect CCC’s and this Bon Appetit French Onion Dip. Are you hosting or attending a SBLIII party? This Onion Souffle Dip or Avocado Verde Dip would be great (hellllllloo post from the archives). And for a sweet treat I recommend this or these. Today's bites post is stacked with photo bites of last week. A full camera roll of weekly images, typically means it was a great week. I suppose I was trying to squeeze as many memories possible into the last week of summer. I wore white everyday, bought a car (!!!! ), finished Whole30, visited a city I've never been to, reunited with college friends, welcomed the start of college football, and sat poolside for probably the last time in 2016. I breezed through the week quick as quick in anticipation of my trip to Houston for OU's first game of the season. Game outcome aside, the weekend was too good. Molly opened her doors for me to stay at "AirbMB" for the weekend. Unfortunately MB was Austin bound for the weekend, but we got a quick 30 minute catch up sesh to make it count! The weekend also included multiple catch up sesh's with college friends near and far who all came together for the game. Lots of memories made and too much fun had. I'm still exhausted and caught up on a high from the weekend. I'm letting it end graciously though as we say farewell summer/hello fall. Let the best season begin. -All white everyday last week before the fashion police say I can't. -Shared a few ways I knock pesky morning headaches. -Spaghetti squash primavera for the last bites of Whole30. -Golden Milk. You have to try it if you haven't, perfect way to end the day. -A somewhat celebratory lunch at Mexican Sugar after purchasing my first car!!! My car accident a few weeks back ended up being a blessing in disguise. -CCC dough rolled into balls and frozen to save for a rainy day, unexpected guests, or those strong sweet tooth cravings. -A trip to Houston meant a quickie meet up with MB before she headed out of town and finally a visit to her place of work at Biscuit. -Lunch at Local Foods was suggested on more than one account. It lived up to all the hype! -All smiles pre OU upset. -If only all college football games came equipped with a bloody mary bar. Hello feta stuffed olives. -A diner breakfast to round out the Houston bites and to soak up Saturday night. -Some rude (smart) person thought it would be a good idea to put a mini Dylan's Candy Bar right next to my Southwest gate. I arrived and left Houston with a big bag of candy store candy. Sour gummies and chocolate covered everything. -Labor day steaks and veggies to send off summer! Meet my friend Molly. She's my blogger bestie, soul sister, sweet to my savory and this past weekend, my getaway gal. Molly and I met on the internet. Laugh to yourself for a second because I am too. It wasn't in a creepy dating site kind of way, but that's what is so cool about the blog world. The people I have met and discovered since starting Take A Bite has made it so worthwhile. Molly and I found each other through the crazy world wide web and instantly new we could be friends. Our amount of similarities is numerous and the way our brain works is almost telepathic. We were strictly internet friends for a while, but claimed each other as blogger besties. Always commenting on posts, sharing blog tips, and swapping ideas. Same age, attended rival schools, are in the same sorority, and have a handful of mutual friends, we knew we would meet up eventually. So far we have caught up at Austin City Limits and OU vs. Texas. This past weekend we met halfway between our two cities. I drove down from Oklahoma City and Molly bussed it up from Houston, to meet in Dallas. It was a quicky 24 hours, but we packed in loads of blogger bestie goodness. First stop was at Flea Style that just so happened to be taking place this weekend. Honestly...it was slightly underwhelming, but it was fun going booth to booth checking out the specialty food goods, catchy greeting cards, whimsical home goods and vintage clothes. After lunch and more shopping a little caffeine was needed. Vanilla lavender lattes from Sip Stir fit the bill. Again with the food pics. I'll let you in on a little secret (this is totally posed), but shhhh don't tell the other bloggers. Drinks and dinner were at HG Sply Co. which doubles as my new favorite Dallas restaurant. A little salmon curry bowl for me and the cauliflower grit bowl with a quinoa patty for Molls. The weekend was idyllic, with the addition of a few spaz moments as we called them. A Mega Bus "experience", a slightly dazed shopkeeper, a few wreckless uber drivers, a waiter switcheroo and the icing on the cake...getting my car towed. Tip: don't park in a fire line. This seems simple, but take my advice. I'm now a pro at "regaining your vehicle after getting it impounded." Memories, ya know? More lattes (the best too might I add) and my favorite meal from Ascension Coffee, made for the last stop on our 24 hour excursion. So much real talk, blog talk, job talk and life talk over the weekend. Thank you internet for helping me find one of my besties! If you haven't already, take a peek at Molly's blog. She brings the words and intellect, while I just bring the food. A weekend away does good for the soul. A fresh atmosphere and fresh faces is sometimes just what you need. My batteries feel charged after meeting Molls halfway. We had been trying to get together for forever, so we pulled the plug and met in Dallas, a spot between our two cities. -I didn't want to, but I went ahead and returned these stellar Asos heels. I'm feeling confident after the slight car towing situation that happened this weekend. After that dent in the wallet, I'm pinching pennies in small ways I can. -Thankful for my parents and their taste in music and how that turned into my taste in music. A night with Lyle Lovett and Robert Earl Keen made for the best hump day. -When your too tired, lazy and hungry to spend time cooking. A Whole Foods brown box fits the bill. -For someone who typically turns her nose up to sandwiches, I've been craving them like crazy lately. -24 hours is the hardest amount of time to pack for. So many things for so little time. -I typically turn my nose up to Starbucks' specialty drinks, but ditch your regular order and try the new citrus mint green tea latte (just two pumps syrup with soy). -Greek mezze and rose` o'clock. -HG SPLY Co. I will have dreams about your bowls from now on. -We met on the internet LOL. -I cherish a friend who will always go bite for bite with me. A savory and sweet finish to a splendid trip!